This mod is a complement to Tinkers’ Construct and adds new tools and improvements for them. 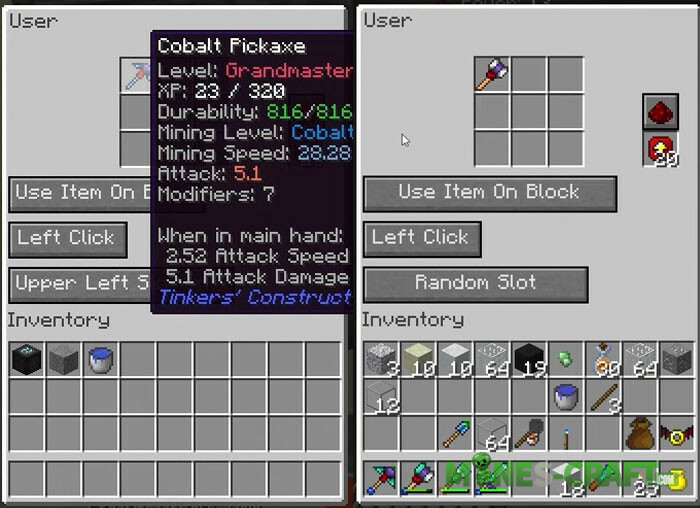 If you like breaking down ore blocks, cutting trees and killing mobs to extract resources, then pay attention to the Tinkers’ Construct Tool Leveling Mod. Your pick or ax will improve and gain experience when you mine ore or wood. This is doubly nice and increases productivity. In addition, some high-level tools will receive new properties, such as high-strength and accelerated use. Open inventory and click on the tool to see its properties. Initially, you have access to the initial parameters and you’ll have to make efforts to improve this or that parameter. In particular, there are strength, speed, magnetism, XP, level, damage and additional properties. Minecraft Forge, the Tinkers’ Construct and Mantle mod (see the archive) must be installed.